There are two slot covers on Samsung Galaxy S4 Zoom. One that covered up the battery and micro SIM card slot, and the second that covered up the microSD external memory card slot. At this section, we just wanna discuss the battery cover / SIM slot cover. For Memory slot's cover, we will talk about on inserting and removing Memory tutorial tab section. Take a look at the picture above. That's how you can remove the battery cover of Galaxy S4 Zoom. With the camera lens facing upwards, on the left side of the phone (as pictured), you can insert your fingernail into the tiny gap on the side cover and pull it out until the cover detaches. Then you can fully opened the cover like the way you open the door. Don't worry there is a hinge that would make the cover always "cling" to the body of Galaxy S4 Zoom. After you opened the cover, you'll see the battery compartment with "slide-lock" and also the micro SIM card slot. To Attach the cover back to its position, all you need to do just closing the door / cover and then press the cover until it attach to the body of the Galaxy S4 Zoom. You might hear that the cover clicks which indicates it properly closed. To insert the micro SIM card is easy. You just need to remove the battery/slot cover on Samsung Galaxy S4 Zoom SM-C101, then align the micro SIM with cut-edge on inside and gold-colored contact facing upward (16MP lens camera facing upwards), and then jush push the micro SIM using your fingertip (forefinger or middle finger or thumb) and make sure it locks. If the microSIM still pop out, that's the microSIM ins't lock yet. Push it until your hear click and the micro SIM locks. To Remove the microSIM from its slot on Samsung Galaxy S4 Zoom, you just need to unlock the micro SIM by push it against the slot and release it. If the micro SIM ejects (pop out), in which you can grap and draw it out freely, that means the micro SIM unlocks and you've done a proprely way on removing the microSIM. Before you able to insert / assemble the battery to its compartment on Samsung Galaxy S4, you must unlock the battery lock by sliding it to right (see the image below). Then just make sure the Samsung Logo facing upwards and the metal-connector of the Lithium ion battery (2330mAh) on the left side and all you need to do just slide the battery and push it inside its compartment. When it reach the end of the compartment, you can unlock the battery by sliding the battery lock from right to the left. To remove the battery just do the same way on the way you try to inserting the battery by unlocking the battery lock from left to right, then just draw the battery out and pull it out completely. 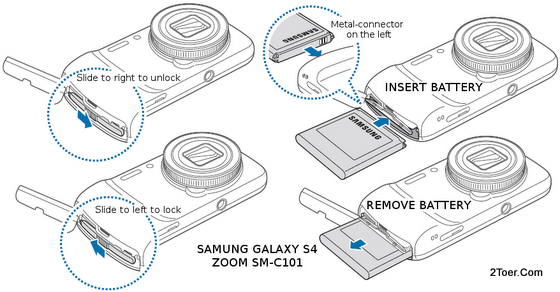 Close the battery "door" aka cover of Samsung Galaxy S4 Zoom SM-C101 back after you've done. The memory slot on the Samsung Galaxy S4 Zoom locates on the bottom side of the device. You can easily find if you take a look on the figure below. The microSD card slot covered with small cover. You can easily remove the cover by using your fingernail. Just insert to the gap between cover and the body of Galaxy S4 Zoom, and pull it out. With gold-colored contacts of the microSIM Memory card facing upwards, then push the card into memory slot until you feel that the microSD card reaches the end of the slot. When you release the pushing card, the card should be locked on the slot and isn't pop out. To remove the microSD card from the slot of SM-C101, you need to push it first to make the card unlocks and pop out, then you can gripped with your finger and pull the card out. Remember that you must always Unmount it first via Settings ~> More ~> Storage ~> Unmount SD card. Pressing the power button on Galaxy S4 Zoom SM-C101 for about 8 seconds or 9 seconds would make you able to force restart the device. This is needed whenever the touschreen freezes or stop responding or the Android OS hangs. You can also make the Galaxy S4 Zoom back to original factory default when the condition still like a brand new phone (the OS and applications), by resetting the device or known as Master/Hard reset. Go to Settings ~> Accounts ~> Backup and reset ~> Factory data reset ~> Reset device ~> Erase everything. When you need hardware combination on resetting the Galaxy S4 Zoom because you aren't able to access the settings (you forget password/PIN/etc), go to Samsung Service Center and ask for their help.